Human Frizzled-2, Fc Tag (FZ2-H5255) is expressed from human 293 cells (HEK293). It contains AA Gln 24 - Pro 190 (Accession # Q14332-1). The protein has a calculated MW of 44.4 kDa. 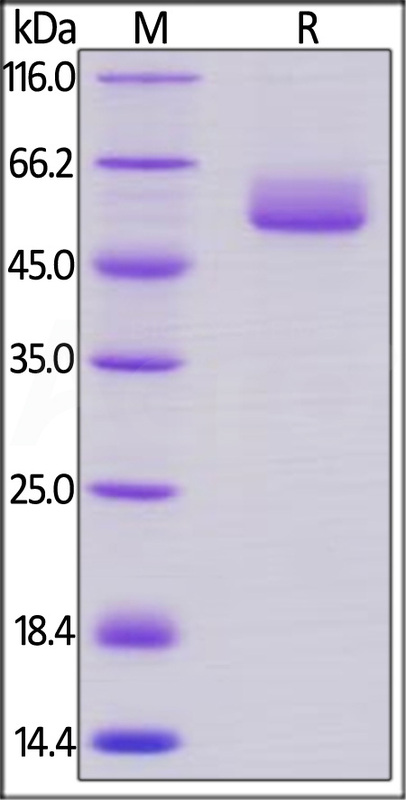 The protein migrates as 50-62 kDa under reducing (R) condition (SDS-PAGE) due to glycosylation. Human Frizzled-2, Fc Tag on SDS-PAGE under reducing (R) condition. The gel was stained overnight with Coomassie Blue. The purity of the protein is greater than 95%. Frizzled-2 (FZD2) is also known as FzE2, which belongs to the G-protein coupled receptor Fz/Smo family. Most of frizzled receptors are coupled to the beta-catenin canonical signaling pathway, which leads to the activation of disheveled proteins, inhibition of GSK-3 kinase, nuclear accumulation of beta-catenin and activation of Wnt target genes. FZD2 contains one FZ (frizzled) domain. FZD2 may be involved in transduction and intercellular transmission of polarity information during tissue morphogenesis and/or in differentiated tissues. The Lys-Thr-X-X-X-Trp motif of FZD2 interacts with the PDZ doman of Dvl (Disheveled) family members and is involved in the activation of the Wnt/beta-catenin signaling pathway. (1) Sagara N., et al., 1998, Biochem. Biophys. Res. Commun. 252:117-122.